Hello lovelies! Almost at the end of another week. Is it just me or does time fly by the older you are? 😉 I am soooooo very excited for tomorrow’s post. I have been waiting for two and half weeks to share it with you!! BUT, before that happens, let’s get to today’s. As always, if you have missed any of the previous challenges or to check-ch-check-check-check-ch-check it out, what-wha-what-what-what’s it all about (Beastie Boys anyone? ), just click on a link below. 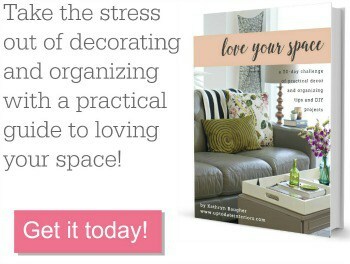 Don’t be afraid to hang pretty things on the walls or to use a nice light fixture. 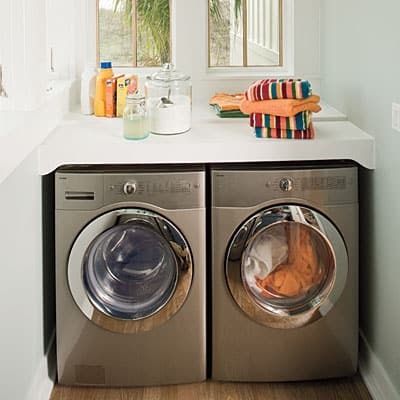 Need a way to hide your washer and dryer? Use a tension rod and hem up some curtains (or make your own). My Outcome: Here’s a little story about a laundry room…. We are in a rental, and as I mentioned in the pantry challenge, the pantry closet was the laundry room. One day, along came a front load washer and dryer that couldn’t fit in its home. So they were forced to live in the corner of a big room with a desk, a full size organ, and other odds and ins. There wasn’t much that I could do but to make it pretty and functional (my middle name, right?). I placed our Ikea desk top on top of them for a folding surface and hung a cafe curtain rod underneath so that I could hide the duo behind a handmade curtain. I would have loved to hung some shelves above it but that’s a no-no for renters. I did use an award winning photograph that my friend took and baskets for storage. Hopefully, the washer and dryer will have a happy life in its home but I can’t wait to have an actual laundry room again. #2 is my favorite but I like your solution as well. My “laundry” currently resides in my kitchen, we are renting for a little while, and I Do NOT like it there, but do what we must. Yes we do! Lol, the hardest part about ours is that the laundry is now on the bottom floor and the bedrooms are on the 2nd and third floor. Thanks for the comment love! We have the drawers under the front loading washer & dryer…occasionally, I remember to put the detergent and things back into those drawers. That sounds nice! I keep our detergent spout right over the washer so all I have to do is push the button. I keep thinking about putting our liquid detergent in a pretty dispenser….